On a recent family trip to Bali, I made a side trip to Nusa Penida, detouring to the largest of three islands 20 km southeast of the mainland, to check out the newest shop of Blue Corner Dive, who I dove with on my first visit in 2013 when I was covering a scuba diving story for an inflight magazine. After opening two shops on the popular jumping off point of Lembongan island (Blue Corner Dive Lembongan and Blue Corner Dive Mushroom Bay), Blue Corner Dive opened its newest outfit, Blue Corner Dive – Nusa Penida, right on the big island, where the best dive sites are located. Blue Corner Dive – Nusa Penida is located in PED village, approximately two kilometers from Toyapakeh, the main entry point linked to Sanur on mainland Bali by scheduled fast crafts and ferries. Unlike its sister dive centers, it’s a smaller operation, headed by British dive instructor Jason Fondis. The establishment sits on a beachside property with a small office, warehouse and outhouse toilets. Closer to the beach, there’s and a small concrete shrine and Balinese gazebo, where Chuckles the dog hangs out. The atmosphere is far more laid-back than on Lembongan, which is getting crowded with resorts and dive shops. So if you’re looking for a tranquil island escape, staying in Nusa Penida is for you. You can also get to the dive sites earlier, before day trippers from Lembongan or Bali arrive. Blue Corner Dive – Nusa Penida is the newest shop of the dive company. The dive center is located along an undeveloped beach, 2km east of Toyapakeh. Travelers endure the rough crossing to these islands to encounter one of the most majestic creatures of the ocean: the manta ray. In the tumultuous seas of these rough-hewn isles these gentle leviathans congregate year-round, feeding on plankton trapped in its bays and having themselves cleaned by other fish. Here, nine out of 10 dives yield an encounter with manta rays, making it one of the best places to observe them in the wild. The resident population are reef manta rays, a smaller coastal species first recognized as distinct from the giant oceanic manta ray in 2008. A warty frogfish next to the rusty chains of a buoy at Crystal Bay. Staying on Nusa Penida gives you the advantage of arriving earlier at the dive sites. 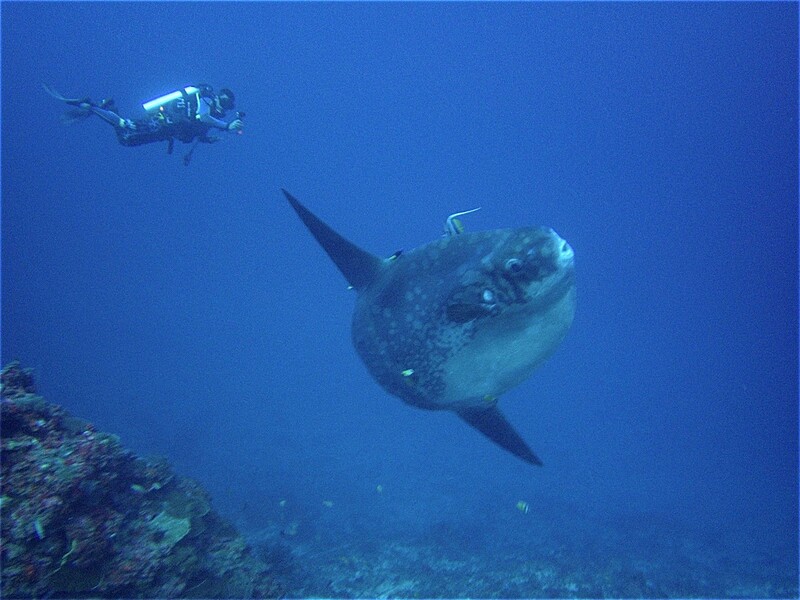 Unfortunately, our dives at popular Crystal Bay yielded no sightings of the elusive mola-mola or sunfish, another large and curious-looking pelagic fish, which surfaces in the waters off Nusa Penida between July and November. The water temperature was cold enough (20 degrees Celsius to be exact! ), and the banner fish that clean them were around, but there was not a trace of the deep-sea dweller. I suppose it was too early in the season, as I visited in June – a month too early for mola-molas. Or we simply weren’t lucky enough. Nevertheless, this gives me another reason to visit these gorgeous islands again! Dive instructor Jason Fondis and Belgian divers during a surface interval at Crystal Bay. On my fourth and last dive, we headed out to Manta Bay, where the eponymous animals are frequently spotted feeding. The swells were too big to go farther up to Manta Point, the cleaning station where I dove four years ago. The ocean surge rocked us back and forth as we circled the dive site in search of its famous residents. Soon enough, emerging from the turbid distance, a reef manta appeared, cruising past us, as if it was late for an appointment. We finned farther, before another big one – around two meters wide – appeared on the other side, this time much closer. The animal took its sweet time, flapping its wings, before vanishing in the direction of the first manta. Before ascending for our safety stop, Jason beckoned to peer underneath a large boulder, which sheltered a sleeping brownbanded bamboo shark. It was an unexpected finale, as it was my first time to see one. A brownbanded bamboo shark resting beneath a boulder at Manta Bay. After our dives, Jason helps us identify the animals we spotted. While pelagics are the main draw for divers here, Nusa Penida also has some spectacular coral reefs. Off the northern coast, the dive sites of Sekolah Dasar and Toyapakeh near the dive center offer exhilarating drift dives along coral slopes and pillars exploding with a kaleidoscope of marine life: emerald six-bar wrasse, blue ribbon eels, lavender scorpionfish, indigo angelfish, orange anemone fish, titan triggerfish, speckled morays and two-metre-long banded sea snakes, to name a few. The islands of Nusa Penida, after all, lie within the Coral Triangle, the global centre of marine biodiversity. Besides spending less time traveling to the dive sites, another great thing about diving and staying on Penida itself is that there’s much more to see here between dives compared to Lembongan. The rugged island is ringed by dramatic seascapes like cliffs, tidal pools, isolated beaches and rock formations. There’s even a hidden Balinese cave temple along the north coast. Blue Corner Dive – Nusa Penida offers guided fun dives starting at IDR 570,000 (PHP 2,187) per boat dive. Discounts of up to 20 % off are available for multiple days of diving. PADI Openwater Diver certification course is offered at IDR 5,300,000 (PHP 20,335). Angel Billabong Fast Cruise has four daily trips to Nusa Penida from Sanur: 7:00 AM, 7:30 AM, 1:00 PM and 3:30 PM at IDR 450,000 (PHP 1,726) for a return ticket. 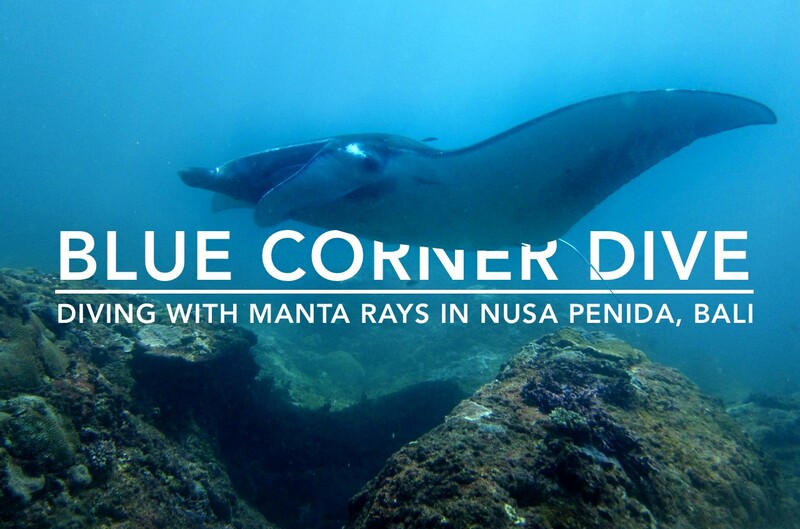 Blue Corner Dive – Nusa Penida is a 30-minute walk from Toyapakeh or a few minutes ride by rented motorcycle. To get around the island, one take a self-guided tour by rented motorbike (IDR 70,000, or PHP 270, per day), or hire one with a local driver/guide for (IDR 350,000, or PHP 1,344). If you’re traveling in a group, or wish to get around more comfortably, one can hire a van with a guide from a reputable tour agency like Discover Nusa Penida for IDR 700,000 (PHP 2,688) per day. The dive center does not offer accommodation yet, but there are a number of affordable guesthouses available at the main village of Toyapakeh, one of the nearest being Jasmine Inn.